'The sweetest, whitest and most pleasant of roots,” raves gentleman gardener John Worlidge in his 1677 Systema Horticulturae, or, The Art of Gardening. “Pleasant and wholesome,” agrees Culpeper’s Complete Herbal. Yet the subtle sweetness of the modest skirret, noted by Pliny as the Emperor Tiberius’s favourite and a mainstay of Tudor tables, is all but lost today. Unfussy in most soils, resistant to disease and relishing frost, this sweet, white root’s downfall was progress. “It’s just not a commercial crop,” explains Marc Meltonville, food historian at Historic Royal Palaces. Relatively low-yield, fiddly to harvest and fiddlier to prepare, poor little skirret’s delightful but skinny roots were overtaken by bold, brash, industrial-scale potatoes and parsnips. Dainty and delicate, skirret’s loss to the commercial world is a gift to the home gardener. 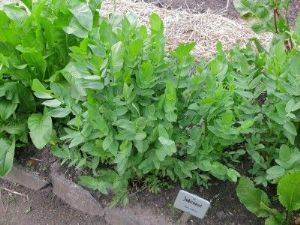 Native to China, skirret arrived in Europe during classical times, probably brought to the British Isles by the Romans. It featured in monastic gardens, but became popular in medieval times and was used a lot in Tudor cookery. “Nobody knows exactly what Henry VIII himself ate,” says Meltonville. “It was his secret.” At each course of every meal 20 dishes were presented for his selection, including meat (a lot of meat), spices, sugars and citrus fruits. Among such exotic splendour good old English veg were taken for granted and are rarely mentioned in reports. Vegetables were used to bulk-out meals, to add flavour and sweeten. Skirret ticked all three boxes but, even better, they addressed Tudor needs that we don’t even consider today, of balancing bodily humours. “By physicians esteemed a great restorative and good for weak stomachs,” continues Worlidge, adding “and an effectual friend to Dame Venus.” Sadly anything vaguely unusual in the Tudor world seems to have been claimed as an aphrodisiac; there’s no proof skirret is any more romantic than cabbage. It tastes better, though. In a world where sugar was prohibitively expensive, skirret’s sweetness was prized but it has a depth of flavour other roots lack. Meltonville describes it as having a sweet start, moving through a carrot-like flavour, with a peppery aftertaste. The main issue is with supply. Hardly any nurseries carry skirret as – well, there’s not much call for it these days. It’s best propagated from small plants but most people are forced to grow from seed occasionally found in specialist heritage collections (and now is a good time to sow). Vicki Cooke, kitchen garden keeper at Hampton Court, has been experimenting with skirret for a year now, consulting old gardening manuals and taking chances. She has found that, as with parsnips, skirret’s close relative, you have to be patient. If you are lucky enough to beg a piece from a heritage vegetable enthusiast, February/March is the best time to take cuttings. Pick off some of the little “slips” (buds) beginning to push through the soil during this period, or break off some of the long, thin roots and replant those. Cooke even sliced hers into inch-long lengths and potted those up. “It seems to be easy to propagate.” So easy, indeed, that some guides warn you to ensure it doesn’t get out of hand. From Cooke’s experiments it doesn’t look as though they will be invasive. At Hampton Court, the opposite seems to be the case and they can’t grow enough to satisfy demand. From this month the restaurant has been serving historic food, including meat roasted on the Great Fire, but as yet skirret is off the menu. “The old books say it needs a rich soil but I’ve found it to be pretty unfussy,” says Cooke. It doesn’t mind exposed or maritime sites and seems to actively enjoy the cold, one of the reasons it was popular in Scotland, where it was known as crummock. Its wild ancestor grows on the banks of waterways (another name for it is “water parsnip”). Skirret’s biggest fan, Worlidge, says it grows well in “a dripping year”, and recommends lavish watering. If the roots get dry, they become fibrous and less crisp. Worlidge continues: “You may also plant them here and there on the edges of your other beds.” Cooke agrees. “I think they’re pretty enough to grow in a flower border. 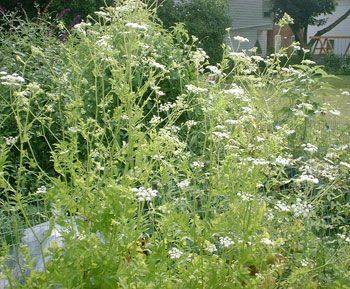 “As umbellifers, they look like mini cow parsley with froths of tiny white fragrant flowers to give a fluffy look.” They grow to about 2ft high and attract insects, especially lacewings. we offer 5 seedlings in a 10cm. pot, ready to plant out.